When patrons walk outside your establishment, they will get a first impression based on the level of cleanliness that your overall exterior has. The outside appearance of your business has a powerful impact on a customer’s decision to purchase your goods. The overall cleanliness of your exterior storefronts and sidewalks should reflect pride and the appearance of the inside of your business. A clean sidewalk and storefront speak volumes about your business and build the customer’s confidence to enter your establishment. Our certified technicians are highly experienced experts in removing chewing gum, oil, grease, tire marks, soda spills, fuel, pollution, and more. 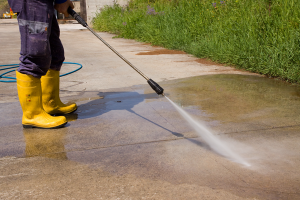 Puma Power Wash offers a variety of maintenance schedules to keep your storefronts and sidewalk spotless, clean, and looking great, daily, weekly, bi-weekly, monthly, quarterly, every six months, and more. We operate 7 days a week, 24 hours a day, so we can provide you with a flexible schedule that meets your need and does not interrupt with your business operation. We will work with you to plan and execute a cleaning program to improve the overall condition and appearance of your storefront and sidewalk.